Opening in December 2003 the Bordeaux, France tramway became the first 'second generation' tramway to use the 'APS' or 'Alimentation par Sol' (ground power) road surface power supply system. As with many other cities Bordeaux had previously used trams - its former first generation system closed in 1958. 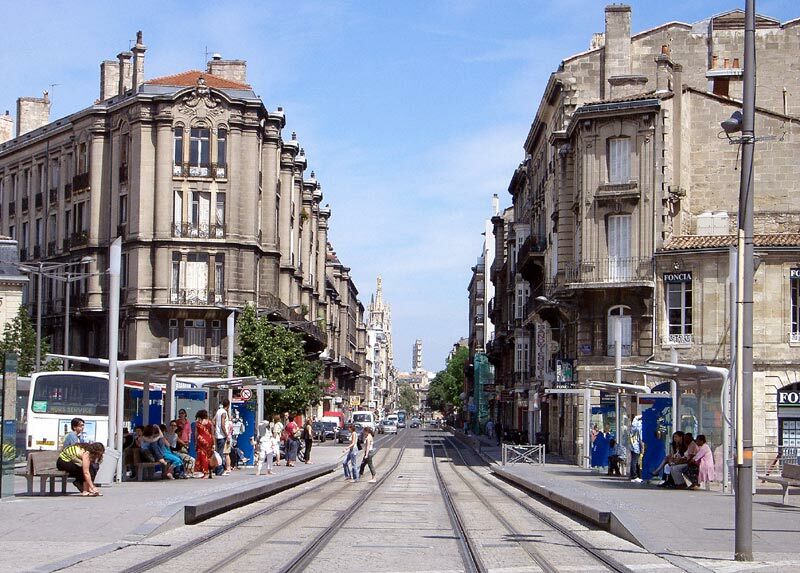 However having seen how other French cities had benefited from modern tramway systems it realised that closure had not been the wisest decision and wanted them back. 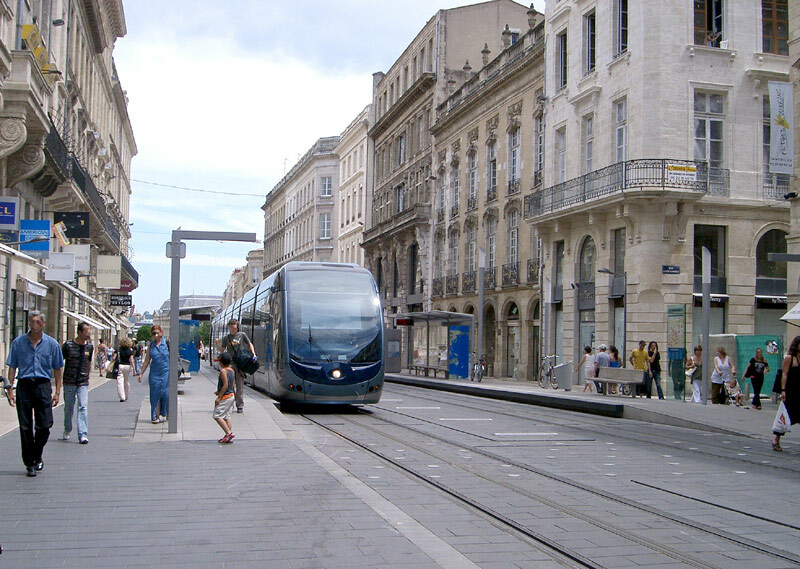 Bordeaux was also one of a number of cities which had previously used an under-road conduit power supply system ('caniveau' in French) and having liked it local people wanted to follow the same principle again on the new tramway. However the caniveau was declared to be unsafe and overhead wires were proposed instead. 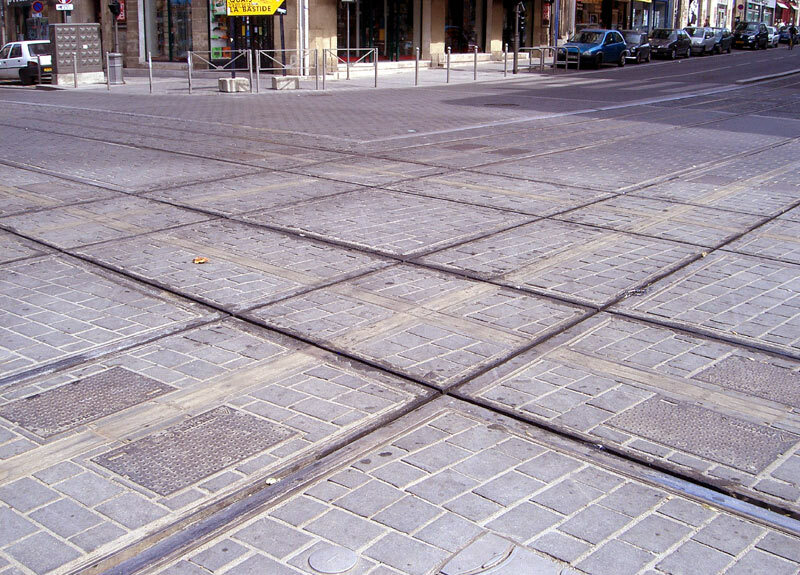 After complaints from both the public and the French Ministry of Culture a modern-day version was developed whereby the conductors (powered rails) are on the surface with electrical power being collected by skates located under the tramcar. 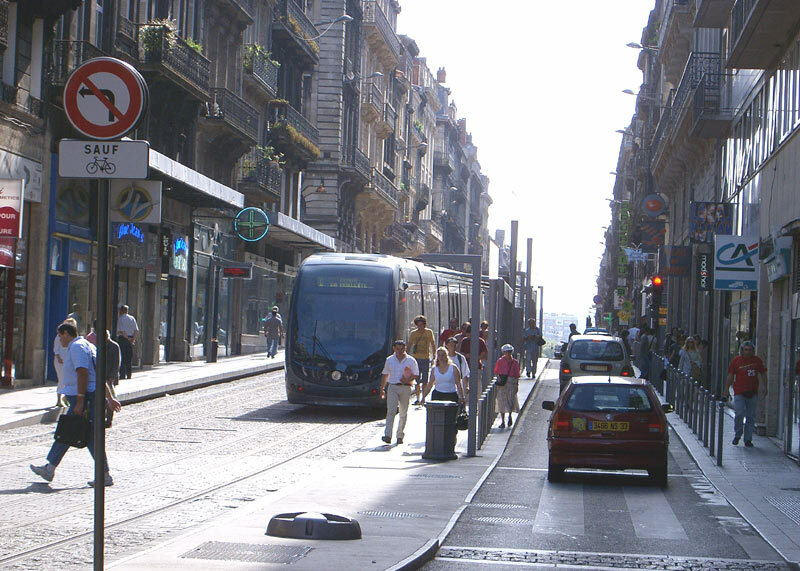 Back in 2003 when the tram system first opened there was 12km of APS powered tramway on a network of 3 tramlines of approximately 21km in total length; extensions opened since then and scheduled to open in 2007 will raise the total length to approximately 43km, with even more extensions under consideration. 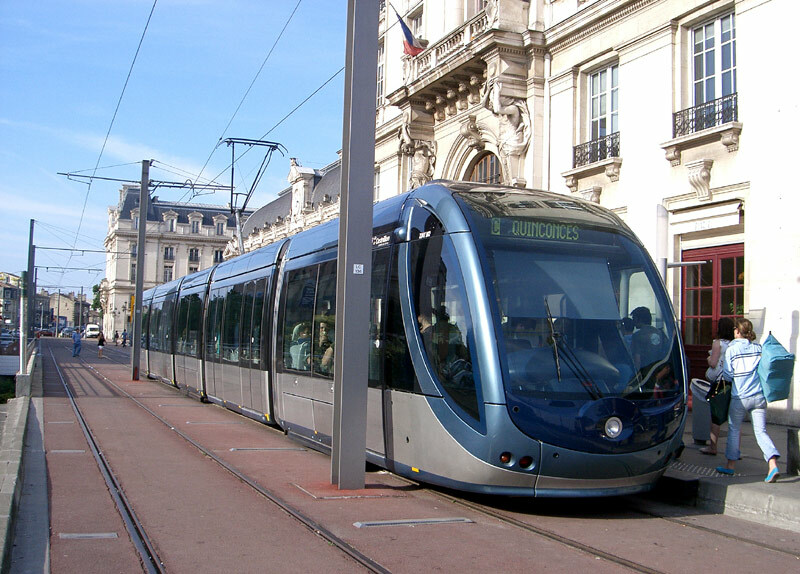 Some sections of APS are located in neighbouring communities towards the outer edges of the tram system - and not just in Bordeaux city centre as some sources suggest. 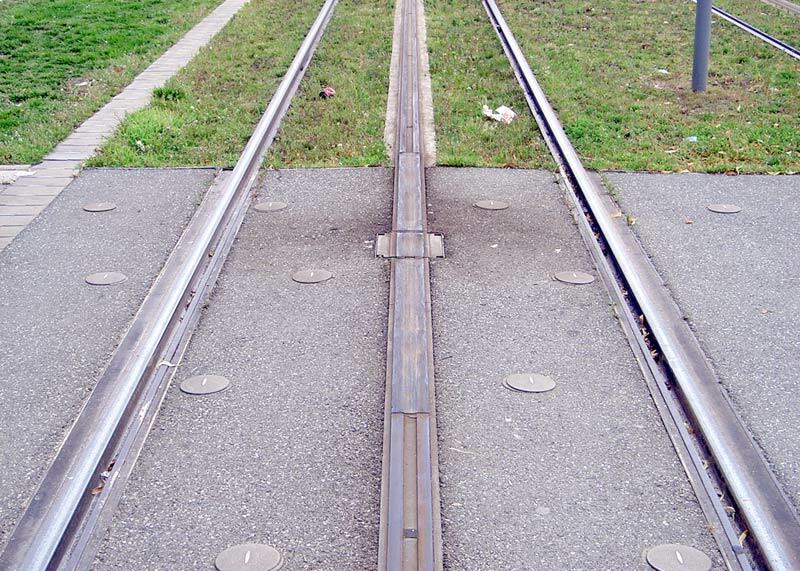 The power rails are typically 11 metres in length, and comprise of an 8 metre segment that is actually powered flanked on either side by 1.5 metre neutral sections. 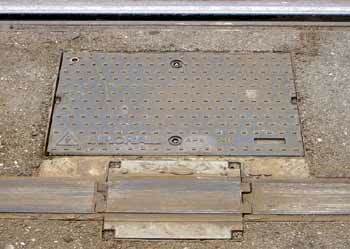 Effectively this means that when installed in to the ground the combined length of the neutral sections are 3 metres. 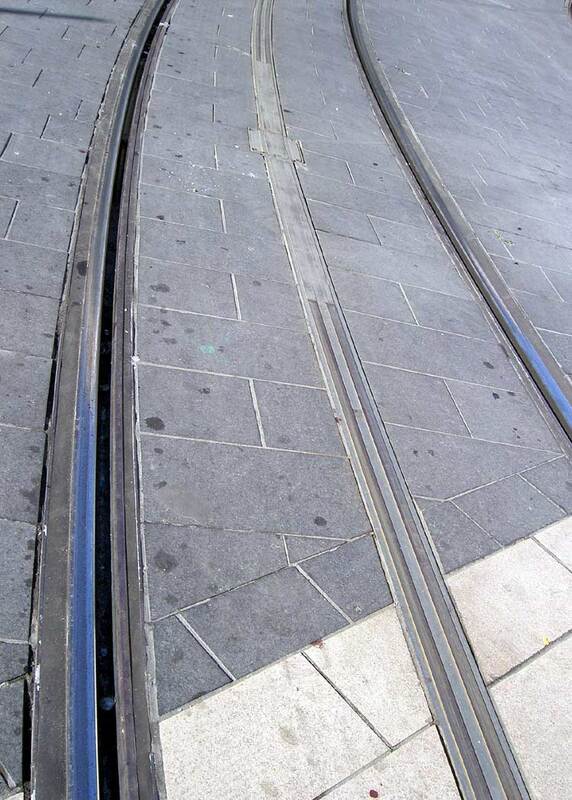 Each tram is equipped with two power collection skates, next to which are antennae that send radio signals to energise the powered rail segments as the tram passes over them. 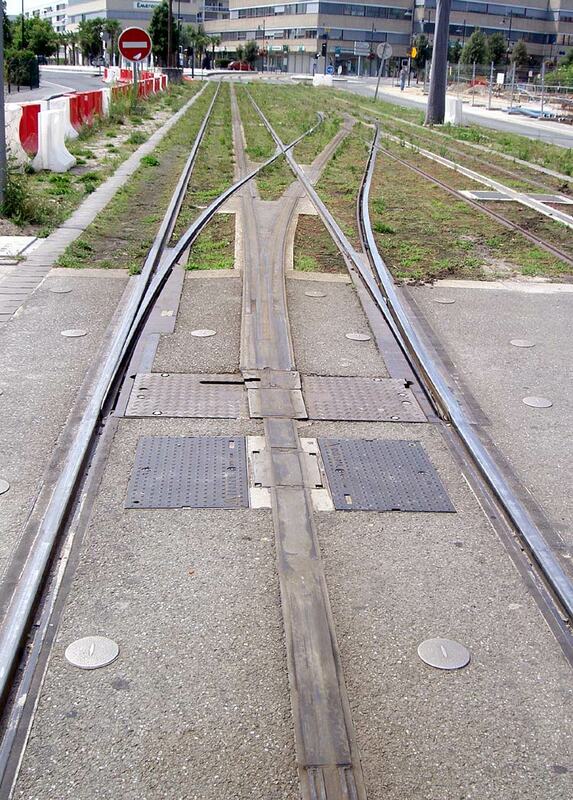 For reasons of safety at any one time no more than two consecutive powered rail segments under the trams should actually be 'alive', with variations to this seeing automated safety cut-outs being activated. These then switch off the offending power rail segment(s) - so that it/they will not switch on again - until being reset by a maintenance person. This can, and at times has, seen trams becoming stranded on unpowered sections of track. 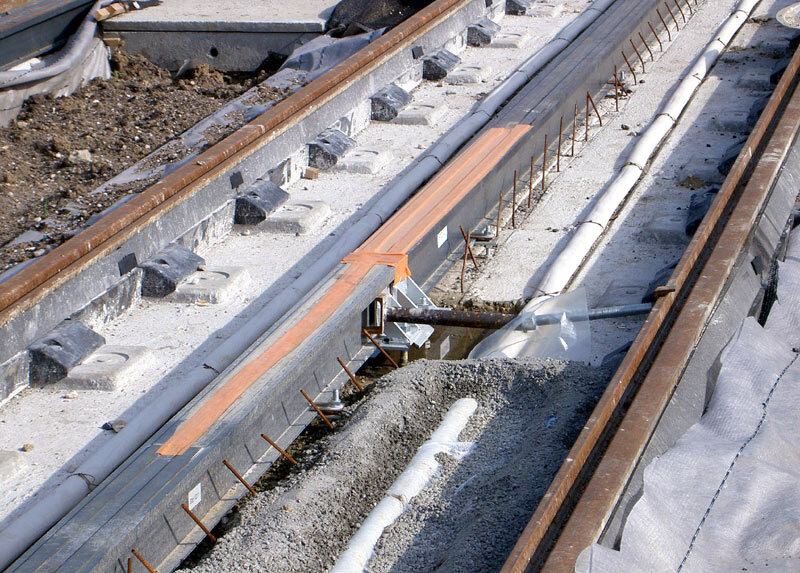 The power rail units are formed from fibre reinforced polymer composite pultrusions which contain integral duct banks that carry all power, ground and control cabling, as well as the vehicle detection loop for that section. They also have a spare cable duct that could potentially be leased to local fibre optic or coax cable service providers. Pultrusion is a high pressure, high temperature matched metal die continuous moulding process in which thermosetting resins and reinforcing fibre are brought together in a controlled manner and drawn through a die; the resin reacts and a constant cross-sectioned profile having great dimensional accuracy and consistent composition results. Before use in Bordeaux the APS system was tested (and proven viable) on a short section of reserved track tramway in the French city of Marseilles. Nevertheless teething problems saw the system being so temperamental that at one stage the local Mayor issued an ultimatum that if reliability could not be guaranteed then the APS would have to be replaced with overhead wires. Although things have improved in October 2005 it was announced that 1km of APS equipped tramway is to be converted to overhead wires. Media reports suggest that if (and once) the system proves its reliability then there will be a string of other cities looking to use this power supply system. To this end, and despite the teething problems, the city of Bordeaux has agreed to help market the system - in return for a financial kickback from any future sales. Problems have been variously described as including issues with water logging when the water does not disperse / flow away quickly enough after heavy rains and that possibly the safety cut-outs have been too quick to operate with issues about restoring power afterwards. Issues with waterlogging is not a new phenomena - for instance the British-style conduit system which was initially used in Madras, India, failed because it could not cope with monsoon flooding of the conduit. Despite initial hopes that the APS system would be cost competitive with overhead wires - and far cheaper than the older type of conduit - it seems that the fixed infrastructure is roughly 3 - 3½ times more expensive to install and 50 times more expensive to operate. Apparently the first few years of operation saw 500,000 euros being spent annually on bus replacements for when the APS system suffered temporary failures. 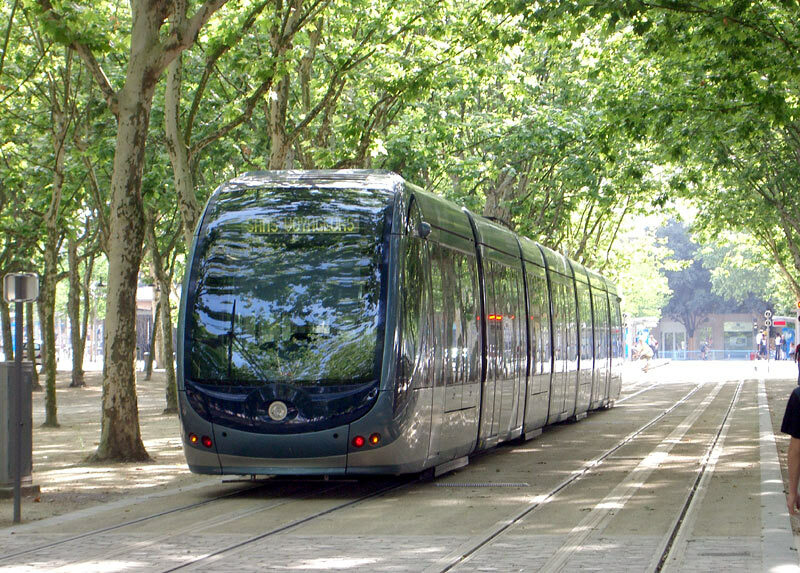 In addition to the cost of the street infrastructure the APS power collection skates and associated wiring, etc are reported to add about 100,000 euro to the cost of the tramcars. Because of the cost some English-speaking commentators have suggested that 'APS' stands for 'Amazingly Pricey System'. Additional images (to those shown below) of the Bordeaux tramway and APS can be found on the Light Rail Transit Organisation (LRTA) website, http://lrta.org - - from the main index select 'photogalleries', and from the country list (further down the page) select France. Images displayed include a section of APS test track (on ballasted formation where the power rail and running rails stand proud of the surface) and the pick-up shoes under the tram. The LRTA website is always worth visiting for news and information about light rail and trams. In addition to the website they produce a monthly magazine which can be obtained at some newsagents / other retailers or (perhaps the best way) by becoming a member of this fine organisation! Membership details can be found on the website, and it is even possible to join on-line - http://lrta.org . 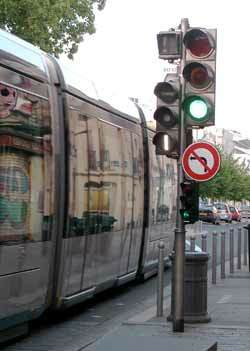 In summer 2006 it was announced that two new French tram systems would be using APS over part of their networks. These were Angers and Reims. 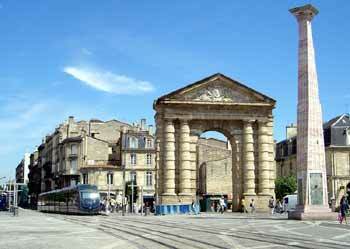 A couple of months later another French city was added to the list, this being Orléans. 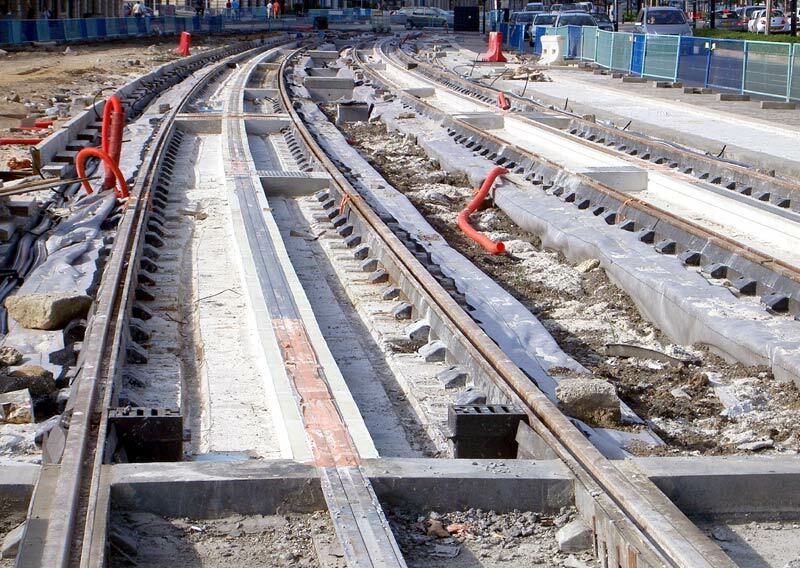 In summer 2008 it was confirmed that APS would be used on the entire Al Soofah tramway in Dubai, United Arab Emirates. This line, which is expected to open in late 2014, will initially feature 11 trams operating over a 10km line with 13 tram stops. The proposals include a phase two, which will use an additional 14 trams as well as add another 4km of track and six stations to the system. 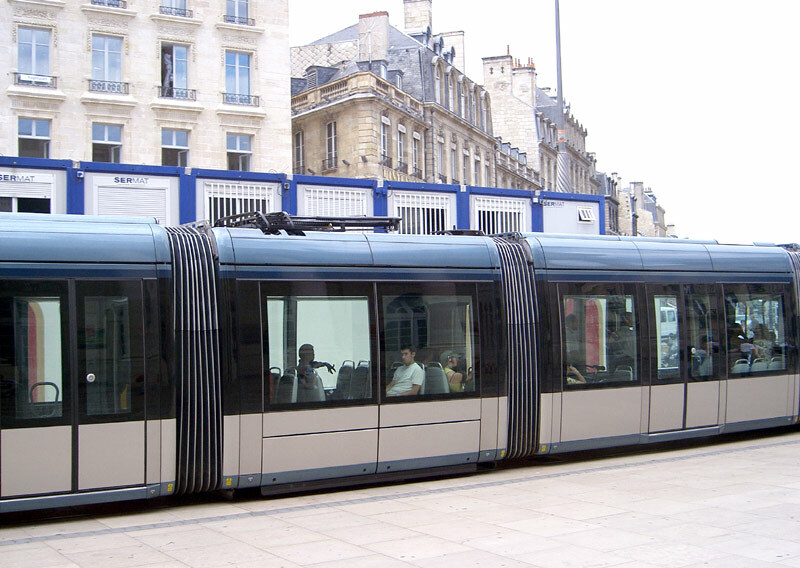 The tram stops will be fitted with automatic platform doors to enable street-level air-conditioning for maximum passenger comfort in a country which has a 'very hot' climate. 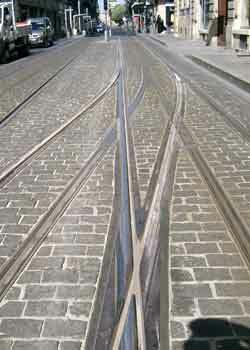 Localisation also means that trams are fitted with brushes to sweep sand off power rails in front of the power pick-up shoes and trams which offer three classes of passenger accomodation - first class (Golden Suite), silver class (dedicated to women with young children) and what amounts to third class, for everyone else. 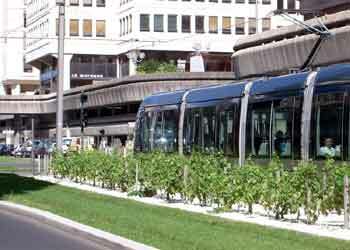 In 2009 the Brazilian city of Brasilia was added to the list of cities which will use APS on a new tramway. 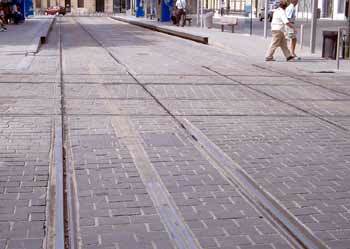 In 2010 another French city announced that APS would be installed on 1.8km of its first tramline; this being Tours. Other towns and cities are reported as being interested in APS as well, although they will only be named here if they actually buy and install a tram system which uses APS. 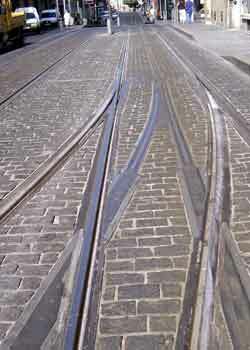 Some of the tramways detailed above have now opened. Angers had been planning to use battery-electric operation but then switched to APS instead. The changed plans saw a total of approximately 1.5km of APS trackage being installed in two locations - the city centre and the suburban community of Avrillé. 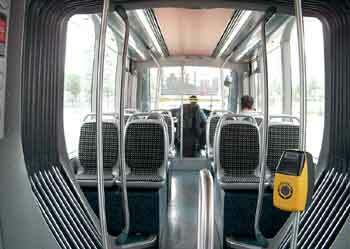 Each section of APS includes three tramstops; two of which are where power supply changeover takes place plus one that is fully wire-free. 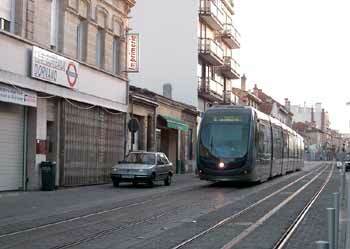 The Angers tramway opened in 2011 and is marketed under the name Irigo. 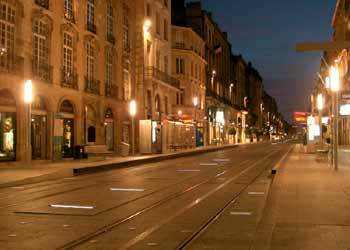 Also opening in 2011, in Reims APS is used in the historic city centre over a 2km portion of the 11.2km line. In Orléans APS is used on line B, which opened in 2012. Approximately 980m in length the purpose is to preserve the visual integrity of the cathedral and the perspective of the Jeanne d'Arc street. 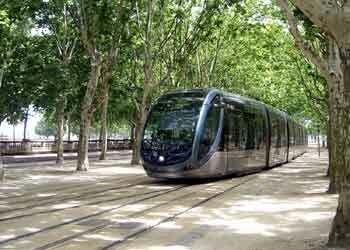 Whilst work commenced on the Brasilia tramway after 11 months a court order ordered its suspension, citing allegations of financial irregularity. In 2012 the government cancelled the project. However in 2013 a 28km (17.4 mile) tramway with six routes, 32 trams and 42 tram stops was announced for the Brazilian city of Rio de Janeiro. This tramway will use APS over 80% of its route and supercapacitor onboard stored energy for 20% of the route. The first part of the system opened in June 2016, in time for the 2016 Olympic Games. 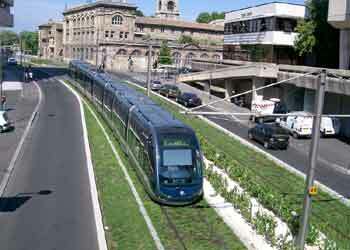 Also in 2013 an APS-powered 10.5km tramway with 27 stations and 14 trams was announced for the Ecuadorean city of Cuenca. 2km of the route through the historic city centre will be wire-free. The first tram arrived in summer 2015 and all being well the tramway is expected to open in 2016. Could APS be used in Great Britain? If ever it were to happen the proposed use of APS here in Britain would pose some legal issues - this is because the power rails would need to be set higher in the roadway than is permitted. 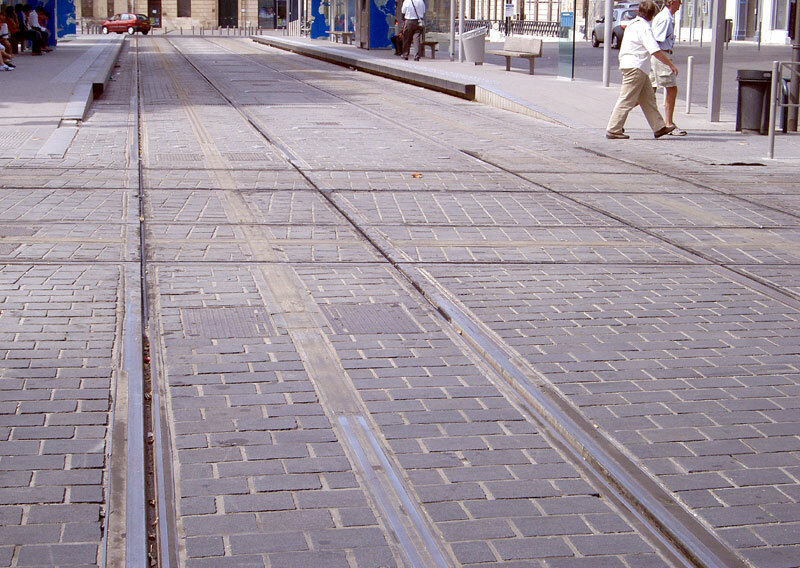 Section 25 of the 1870 Tramways Act, as originally enacted, requires that the tramrails be laid and maintained in such manner that the uppermost surface of the rail shall be on a level with the surface of the road and although the 1870 Tramways Act was generally repealed by the 1992 Transport & Works Act certain clauses (including section 25) are often still included in enabling legislation for new British tramway systems. For a possible use of the APS system here in Britain it would be necessary for the enabling legislation for the tramway to directly address any special requirements this poses. Perhaps some people would say that the 1870 legislation applies to the rails used by the wheels, and not power rails.... this being a debate which would be for lawyers to address. Another issue would be one of cost - getting past the British Government's very stringent financial criteria would probably prove be an even bigger hurdle than simply adding a few clauses in a bill already going through Parliament specifically allowing something which older legislation might otherwise have prohibited. As an aside, the 1870 Tramways Act made this requirement after a street tramway in London using a type of rail with a three quarter inch step proud of the road surface was found to constitute a public nuisance - although apparently a similar installation did not create a nuisance in Birkenhead. By enacting this legislation Parliament decided that proud rails constitute a greater nuisance to users of the public highway than depressed rails. 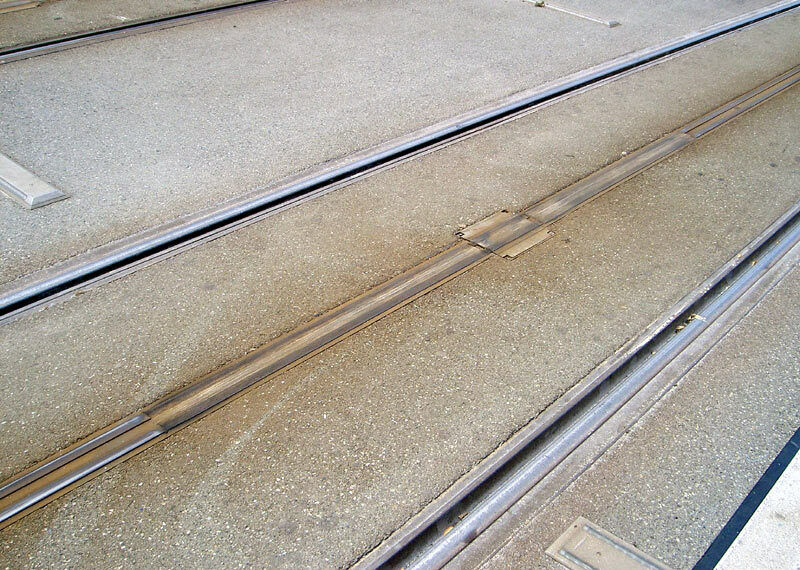 It is unknown whether present-day cyclists, who sometimes complain of their front wheels falling into the groove in the tramrail which is used by the flange on the tramwheel, would find depressed rails constitute a greater nuisance than a small raised flange. 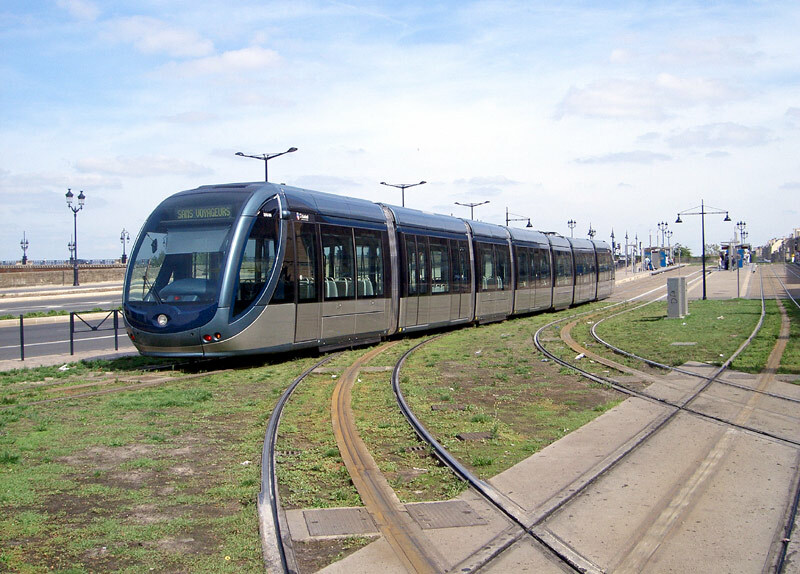 In December 2006 it was revealed that in the past year the number of daily journeys on the Bordeaux tramway system had soared by as much as 26% - reaching 180,000 - this being a very commendable 90% of the projected 200,000 daily journeys for phase 1. 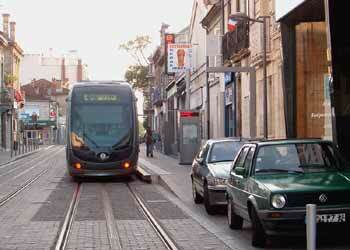 In addition, it was revealed that the three tramlines are now carrying more than the entire Bordeaux bus system. Also revealed is that reliability has reached 99%, which is especially significant in light of the teething problems with the APS ground power system. 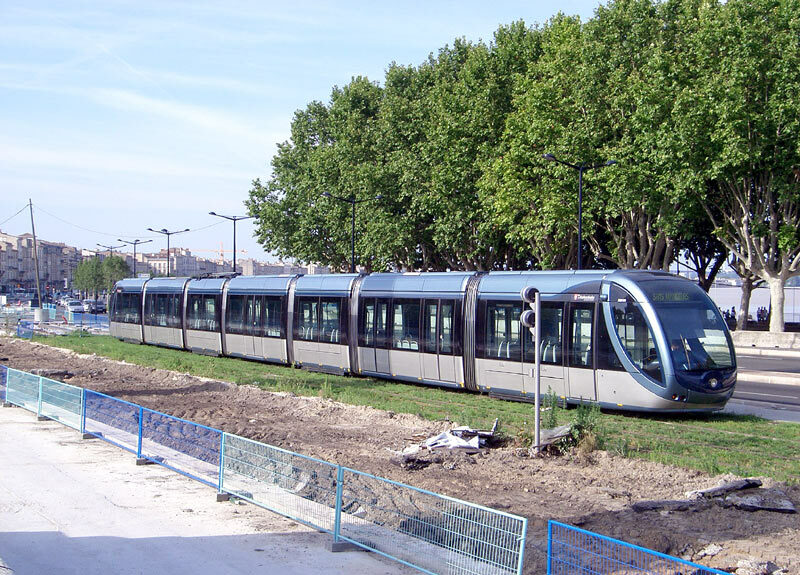 By 2008 the Bordeaux tramway had reached 44km (27.3 miles) in length, with 14km (8.7 miles) of that being powered by APS. Three mono soundclips recorded using a mobile telephone. All come from trams on Line B. Passengers travelling in the correct part of the tramcar can hear the APS power collection shoes, this is especially noticeable at the transition points between the sections of powered rail and the neutral sections, and where they pass over the insulating joint boxes The first two soundclips demonstrate this. This link for a 630kb file named 'APS1.mp3'. Also heard is the announcement for Bergonié tramstop. This link for a 344kb file named 'APS2.mp3'. 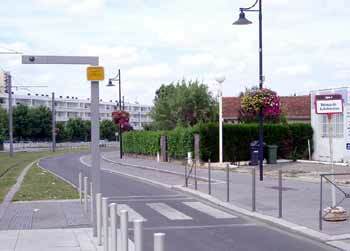 Also heard is the announcement for Berrière St-Genès tramstop. This link is for a 745kb file named 'Arrival-Quinconces.mp3'. The third soundclip comes from the front of the tram, so the APS shoes are not heard. Instead sounds heard here include: gongs to encourage pedestrians to stay clear of the tram / not to be too near the tramstop platform edge, the 'rumble' of wheels passing over a crossing (for the future extension of Line C), 'squeaking' of the tramcar as it turns right and the 'next tramstop' announcement. These photographs include views from various locations along the Bordeaux tram system. However they are more of a collection of images than an attempt at a detailed tour of the system. 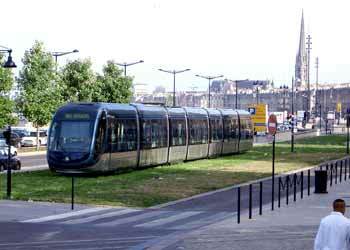 For instance, there are no images of the trams on Line A crossing the River Garonne on the pont de pierre. Important Note RE: Place Names... the same capitalisation of first letters is being adopted as per the streetmap supplied by my hotel. So, whilst tram stops have the initial letters capitalised, place names are generally all in lower case. 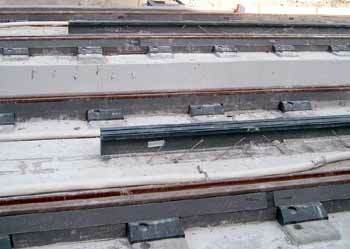 A section of straight APS track showing the neutral sections at the end of the powered segments plus one of the insulating joint boxes which mechanically and electrically join the APS rail segments. A section of curved and paved APS track, note how the APS track follows the curvature in the track. 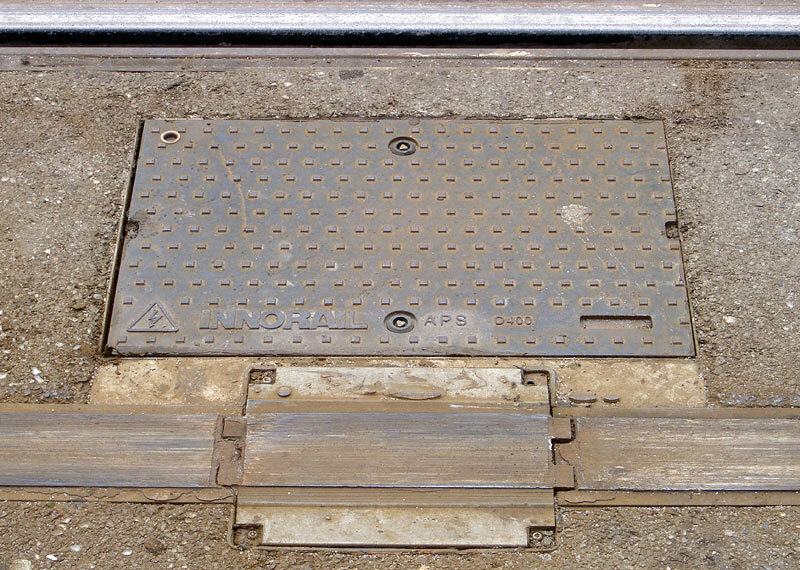 The APS power rail sections are designed with a very low profile, standing only 17cm (6.7") tall, so they can be easily accommodated in virtually every type of track installation, including paved, cobble stoned, tarmacadam, ballasted and lawn, as well as being retrofitted to existing systems. 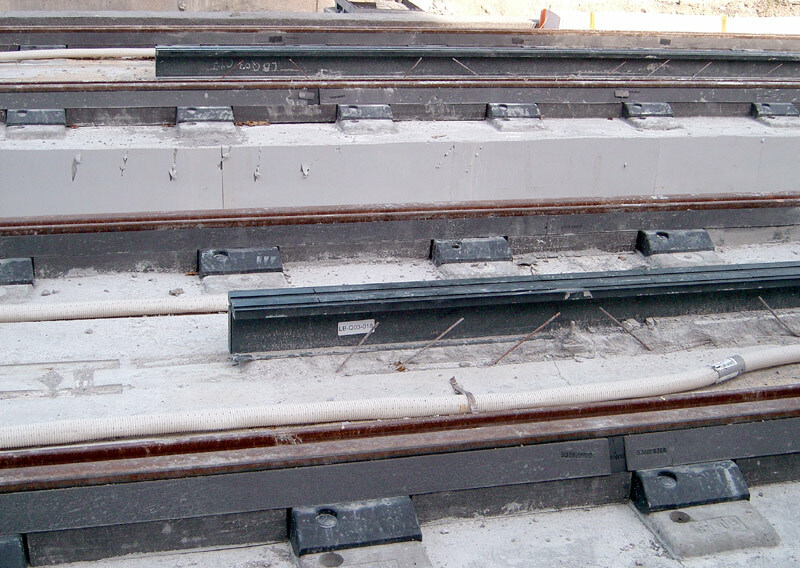 The insulating joint boxes are located between sections of ground power rail and once all (electrical, etc.,) connections have been made they are silicone sealed to keep out moisture. Also seen here is a power rail control contactor unit (marked "Innorail" on the cover). These are normally located by every second insulating joint box, and control two segments of power rail. Internally they are modular and can be replaced in less than 5 minutes. The switching of traction current is by means of traditional contactor units; trials with solid state switching units found that the short duty cycles caused difficulties in semiconductor heat rejection at the high current levels the system uses. Once technically feasible it is probable that a solid state solution will be introduced. 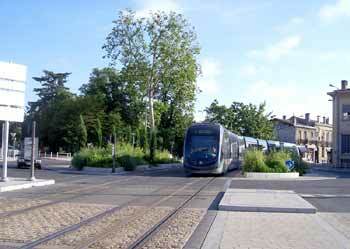 A junction on the APS trackage at Cenon la Morlette which at the time of visiting was a terminus on one of the north-eastern branches of Line A.
Photographed whilst waiting 28 minutes for a tram back to Bordeaux. Because of the extended gaps between trams most people travelling away from the city centre were taking the first tram to where Line A splits in to two branches and, if necessary, then walking the rest of the way. This included crossing roads at potentially dangerous locations and walking along the tram tracks, even where there were 'no pedestrians' signs. 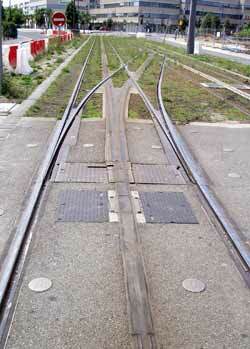 Of course, no-one really wanted to do this, but it was quicker than waiting for the next tram! 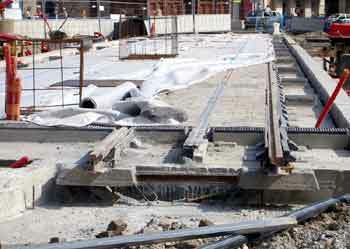 The crossing of special track work such as points (turnouts) and crossovers is made using special insulated sections, which allow the pick-up shoes to cross the running rails. Another view of the points seen above - these images come from cours d'alsace et lorraine on Line A right in the heart of the city centre. Tram Lines A & B cross at right angles very close to the Hôtel De Ville tramstop. The insulated sections of APS track are longer here than usual, nevertheless even if a tram does stop with both sets of power collection shoes straddling the dead section it should have more than enough power in its batteries for it to travel to the next section of powered rail. 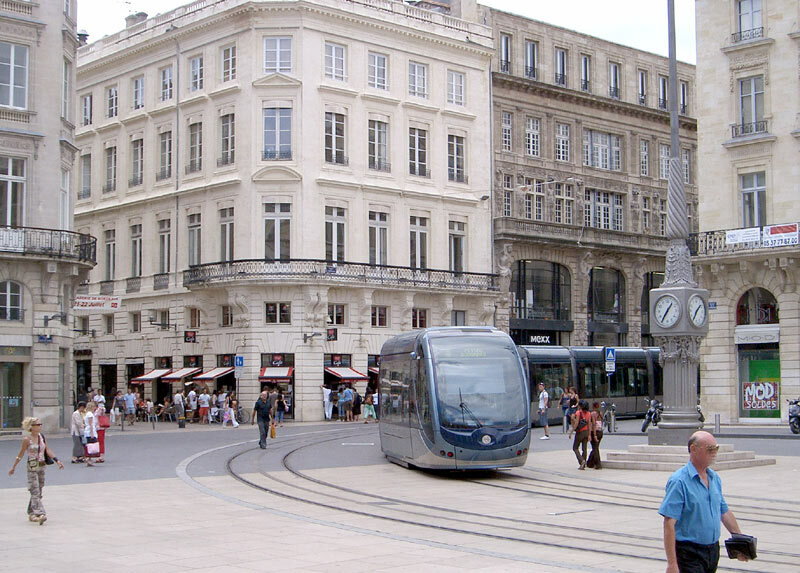 Another view of the crossover, with the Hôtel De Ville tramstop seen in the background. APS track under construction on Line C at place paul douner. 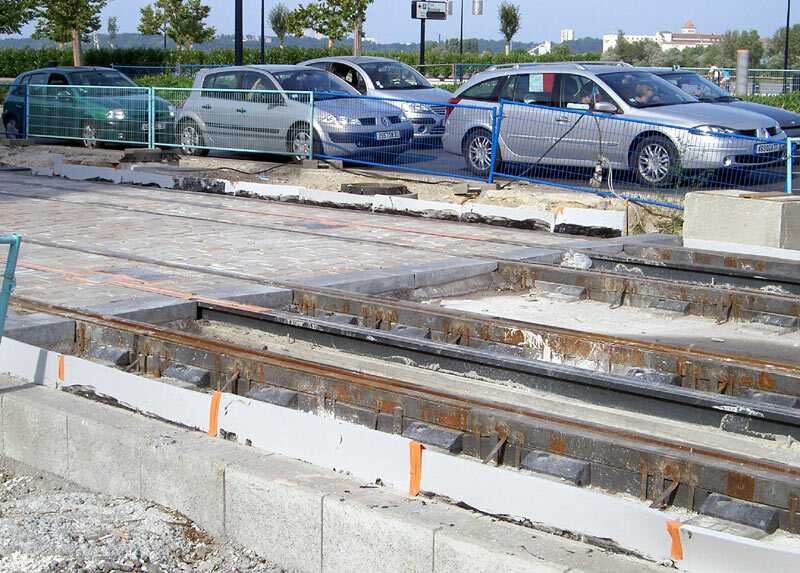 Also seen here are some preparatory works for a tramstop. APS track under construction on Line B on quai louis XVlll where the trams will use lawn track. Another view from nearby the same location as above. 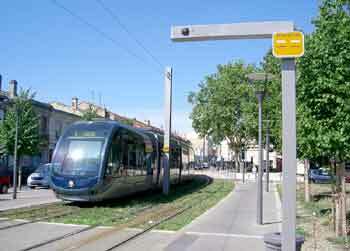 In Bordeaux the transition between APS and overhead wires (and vice versa) is manually initiated by the tram driver whilst making station stops. The process takes just a few seconds, so is usually completed within normal station dwell times. According to the manufacturer it is also possible for this process to be automated, allowing the transition to be accomplished with the vehicle moving. Not shown is the actual changeover process whereby the pantograph rises or lowers (mainly because I am so used to seeing similar in London that I did not make photographing it in Bordeaux a priority!) Although this may seem novel to some viewers, for those who live in cities where there are already rail services which include 3rd rail and overhead wire operation along different stretches of the route so seeing the power supply changeover, with the pantograph rising and falling as appropriate, is 'nothing special'. The list of locations where trains use a combination of electric rails and overhead wires for different sections of the same route includes London - several suburban routes plus Chunnel Tunnel 'Eurostar', New York City, Boston, Oslo and Amsterdam. Some of these are 'heavy' rail mainline services, others are urban / metro / subway services whilst yet others involve 'light' rail / trams. On some systems the changeover is carried out whilst stationary; on others it is 'on the fly'. 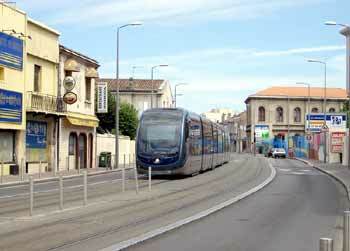 An eastbound Line A tram travelling on APS arrives at Gaviniès tramstop which is also a transition point between APS and overhead wires. Also visible is an end mast for the overhead wires. 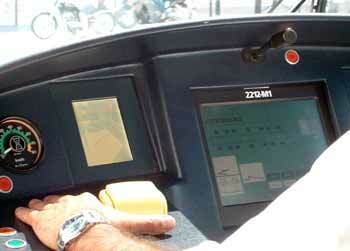 The sign on the CCTV post tells the tram driver to travel in APS mode. By way of contrast to the previous view this sign on this CCTV post tells the tram driver to travel in overhead wire mode. On the right can be seen an emergency bus stop sign, for use when the trams are not working. This image was taken at Pelletan, which is one of the outer suburban communities through which Line A passes. In light of the emergency bus stop sign plus with the Sunday afternoon service infrequency of a tram every 40 minutes it was felt to be very appropriate for no tram to be visible in the image. 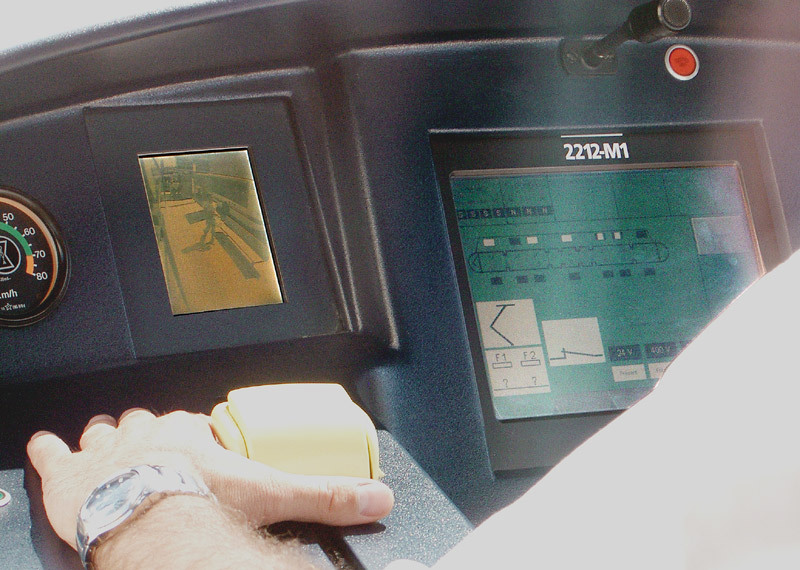 A view of the driver's cab, included in what can be seen here is one of the two CCTV displays which help the driver watch the doorways whilst calling at tramstops and an information display showing the progress of the transition from APS to overhead wire mode. Another cab view, this time the two left displays in the central information panel are showing both the pantograph and APS shoes as being lowered and ready for roadway power collection. A tram on Line B using APS whilst travelling on a suburban street near the Roustaing tramstop. 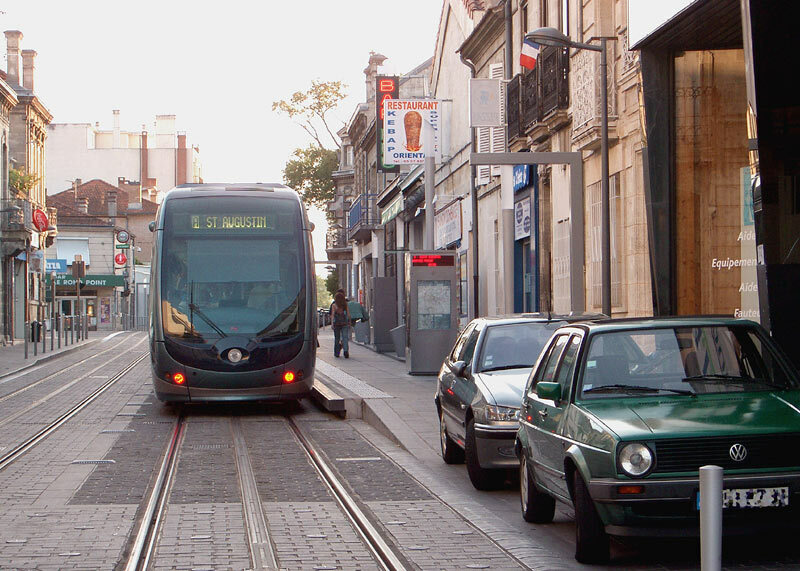 A tram on Line B for Pessac Bougnard travelling through the city centre pedestrianised zone turns right out of place de la comédie and in to cours de l'intendance. As can be deduced from the actions of pedestrians, people happily walk across the tracks and APS power supply rails without any undue concern for their personal safety. 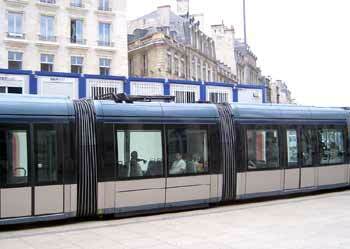 A tram on Line B tram quietly glides through place de la comédie clearly showing its folded down pantograph. 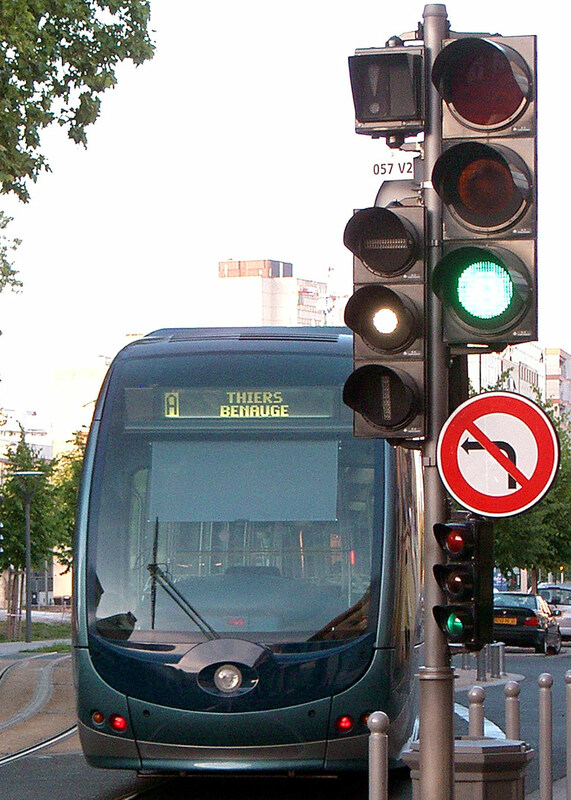 A tram on Line B heading for Quinconces calls at the Grand Théâtre tramstop. 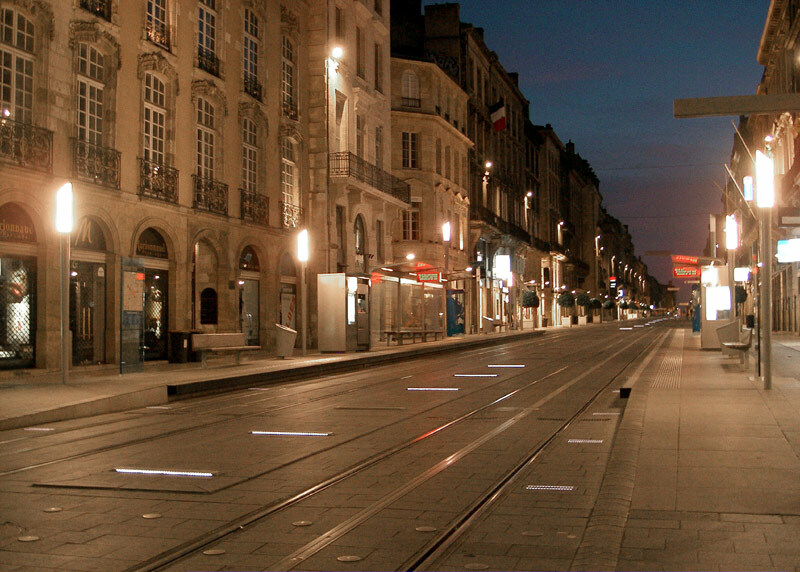 This is on cours de l'intendance and right in the heart of the city centre pedestrianised zone. The same location as seen at night, showing the transverse white LED (light emitting diode) ground level markers which are a feature of the parts of the system (mainly stops / stations) - although they did not seem to be illuminated at all locations. Another nocturnal view also showing the white LEDs. 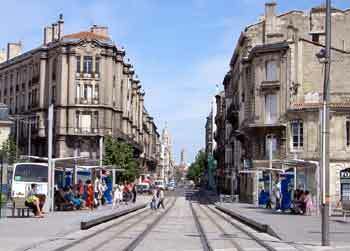 The location is Place Du Palais, which is one of the two Line A city centre tramstop on cours d'alsace et lorraine. Calling at the Ste-Catherine tramstop which is the other Line A city centre tramstops on cours d'alsace et lorraine. 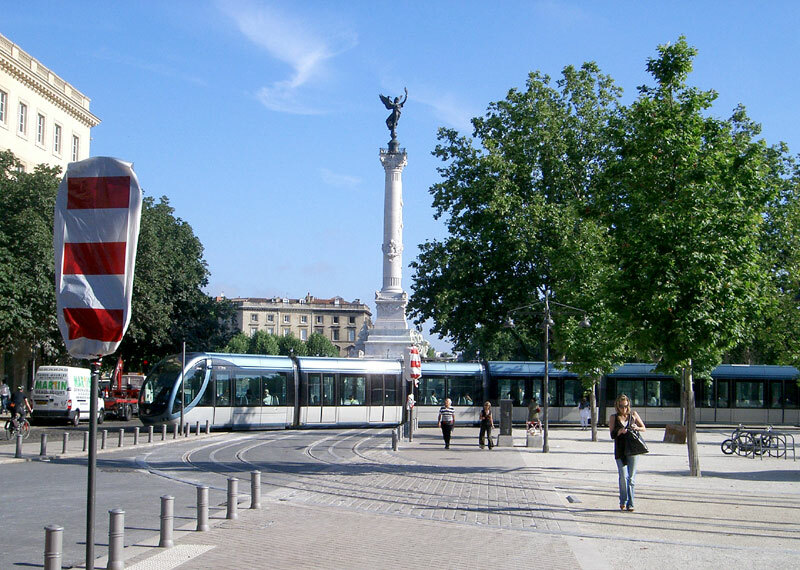 A northbound tram on Line B heading for Quinconces arrives at the Victoire tramstop having just traversed the prestigious place de la victoire. A view of the Victoire tramstop. 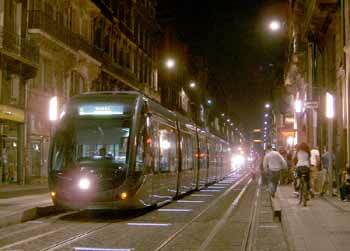 In this late evening view an eastbound tram on Line A proceeds along the narrow partially pedestrianised rue d'ornano. The sign on the building facia suggests that this scene could be in a totally different city! 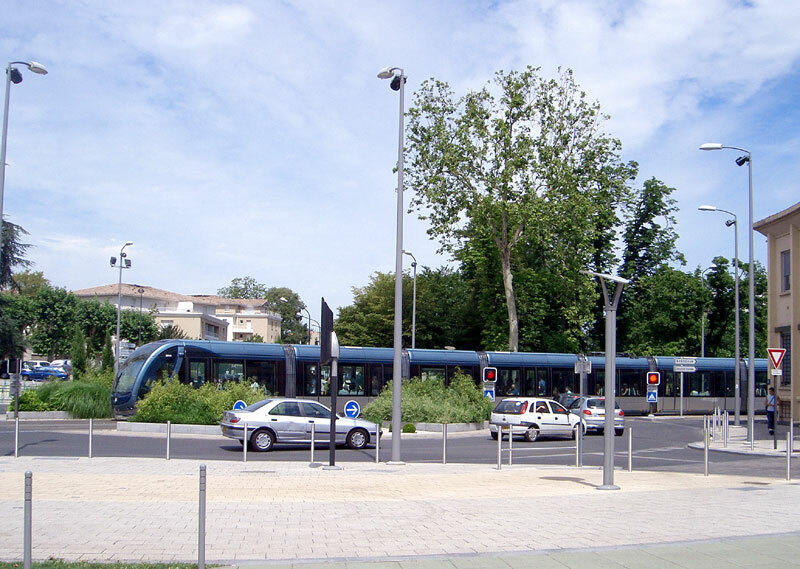 A westbound tram on Line A calls at the Stade Chaban-Delmas tramstop, which is located on rue d'ornano and staggered on the approach sides to a busy junction. Note how that because of the narrow footpath the tramstop completely encompasses it. At a roundabout near to the Forum tramstop on Line B. Note how the trams travel through the central circle. A different view of the same location as before - for safety the red warning lights flash when the tram approaches, giving it priority to pass across the other traffic flows. Note that except for where the tram and other traffic interact there are no other forms of traffic control. 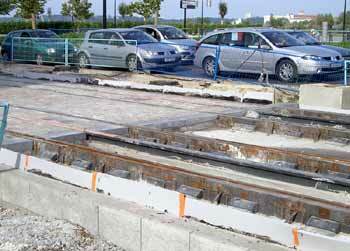 At the time of this visit (July 2006) Quinconces was the terminus of Lines B and C (plus a number of bus routes) although as other images on this web page suggest extentions to both these lines are under construction. 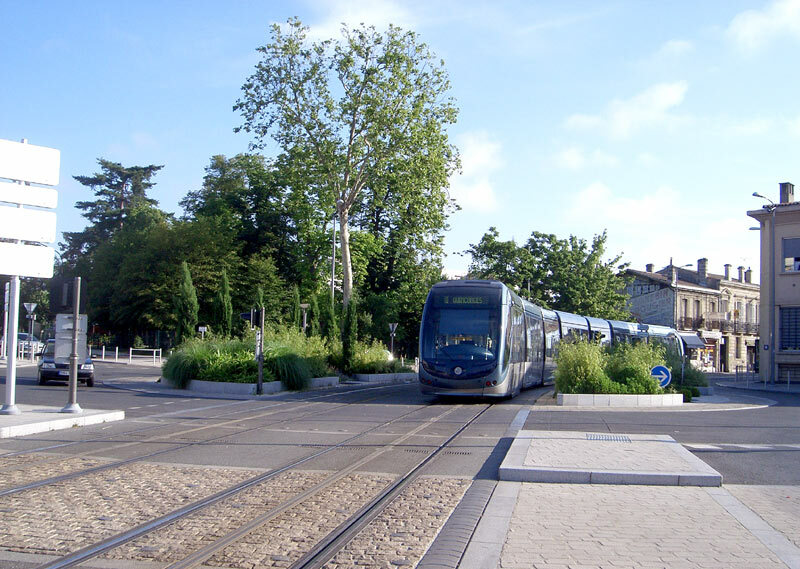 This view shows a tram on Line B heading towards Pessac Bougnard leaving what will be the northbound track (but at present is a head shunt) to commence its return journey. At Quinconces Lines B and C are totally separated from each other, having their own platforms a little under a minutes walk apart. Both however travel under visually similar tree lined rights of way. This view shows the same tram as before, whilst laying over on the headshunt. A tram on Line B arrives at Quinconces, crossing tracks which currently are not in service but will be used by Line C trams when it is extended beyond here. With Line C in the foreground and Line B in the background this view should help give an indication of how that despite being parallel to each other the two lines are a short distance apart. Although not physically connected here there are linking tracks nearby, where the two Lines run / will run along the quayside of the River Garrone (see below). 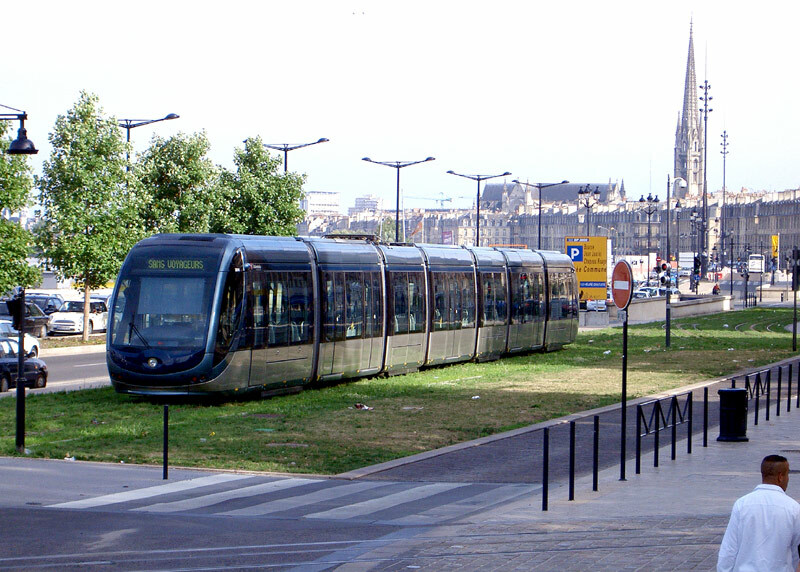 In the centre of Bordeaux the trams travel along a lawn track reservation parallel to a roadway and the left bank of the Garonne river. To the south of Quinconces this is part of Line C, whilst to the north of Quinconces this will be part of Line B.
Presumeably the local grass is of a different nature, this is because it is less dense / features more bald patches than lawn trackage seen in other cities elsewhere in Europe. 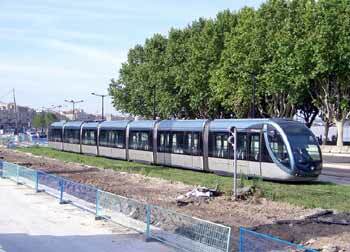 A tram that is not in service on a short section of lawn track that will be part of Line B but when this photograph was taken (July 2006) is not used for passenger services. In the distance, and behind the road & trees can be seen the Garonne river. This image was taken on quai louis XVlll with Quinconces out of view to the right. Just visible in the far right edge of the lawn track (near the right-hand edge of the image & behind red signal at which tram is waiting) are the tracks used by trams on Line C; whilst across the foreground (bottom edge of the image) can be seen part of the future Line B. The tram seen here is not in service and on what will be a linking track between Lines B & C. Of course without overhead wires seeing the tramlines is that much less easy. Seen further along the quayside at quai richelieu, a tram which is also not in service uses a (different) section of linking track to travel from Line C to Line A. This photograph was taken whilst standing where the two lines cross each other, with Line C travelling parallel to the river (behind me to the left) and line A travelling along cours d'alsace et lorraine (to my right). In the distance to the right can be seen the Porte De Bourgogne tramstop, which features four platforms, with those for Line A on the left and Line C on the right (the latter only partially seen here). A tram on Line C travelling under overhead wires at its (initial) southern terminus of Gare St. Jean, which serves the mainline SNCF railway station of the same name. 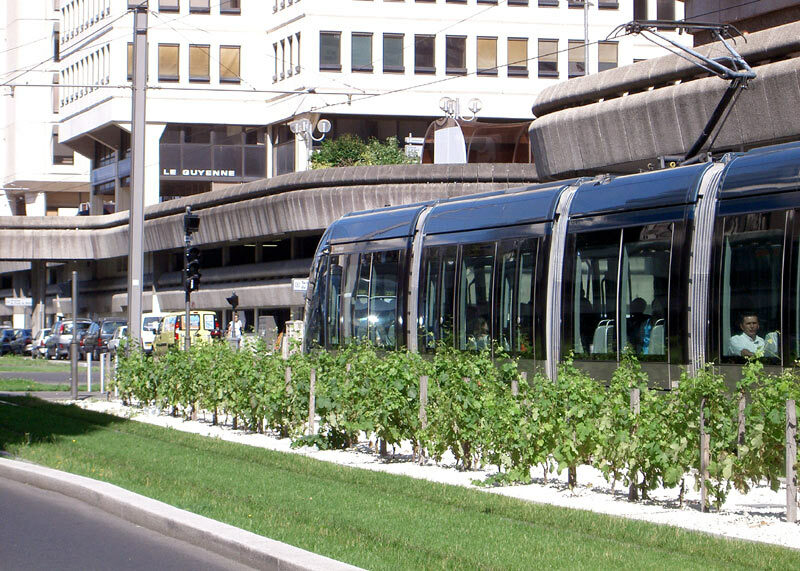 Part of rue claude bonnier on Line A showing a section of overhead wire powered tramway with grape vines growing between the tracks! A view of rue claude bonnier and the linear vineyard as seen from an elevated location. In common with many other French (and beyond) cities in Bordeaux the trams use dedicated traffic signals which to avoid confusion feature different aspects than those used by the general traffic. 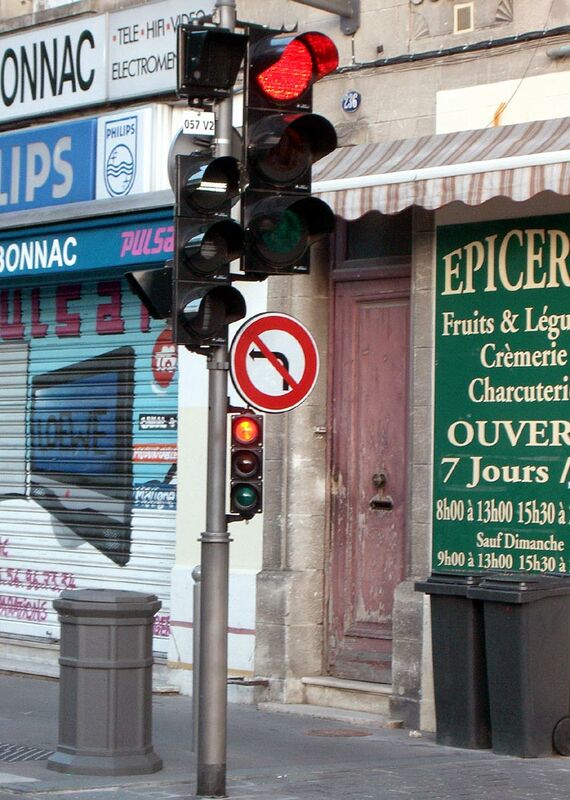 Also seen here are the lower level repeater traffic signals placed at a height where they may be more easily seen by car drivers and cyclists which are a feature of French traffic signalling systems. For 'go' instead of a green lamp they use a vertical white bar. For 'amber' instead of an amber lamp they use a white dot. As this view suggests, the lights for the trams do not always change in tandem with the lights for the other traffic. For 'stop' instead of a red lamp they use a horizontal white bar. 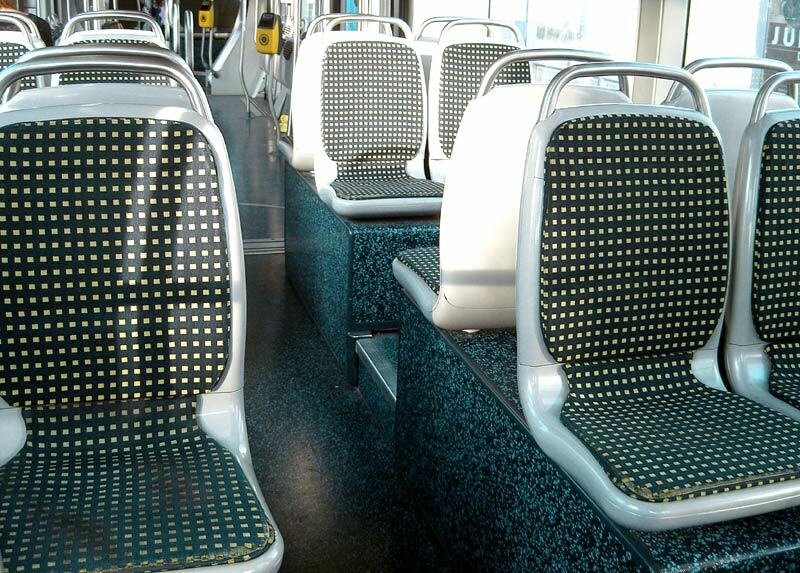 Inside a Bordeaux tram, showing the fold up seating in an multi-purpose area which is also suitable for people who use wheelchairs, children in pushchairs, etc. 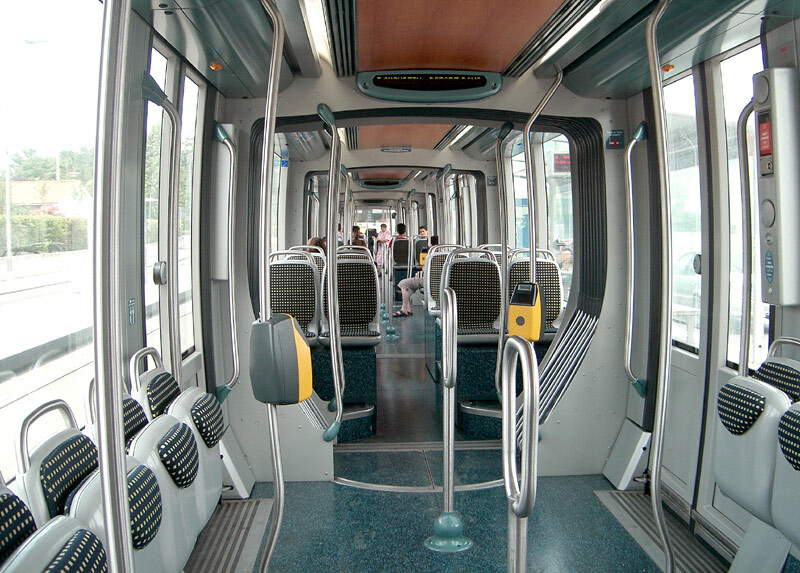 An internal view of the front section of a Bordeaux tram, the tram driver is physically separated from the passengers, although thanks to a glass screen they can still see out the front & back, if they wish to do so. 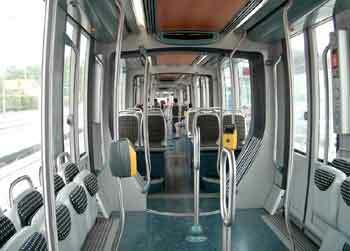 Inside a Bordeaux tram, showing the 2+2 seating which is located on podia and arranged in groups of 16. 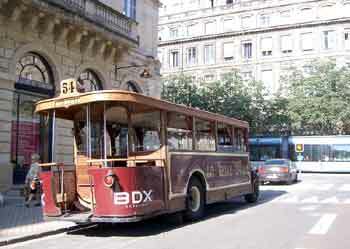 A genuine 1930's Bordeaux motorbus which operates tourist-orientated tours around the city outside the tourist office at 8.30am on Monday morning whilst a tram on Line B (with its pantograph folded down) travelling along cours 30 julliet passes by. alternatively clicking here will open the page in a new full-size window. 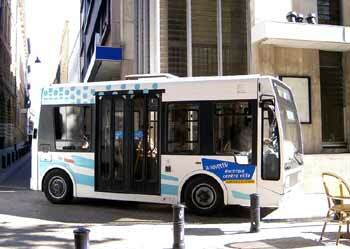 A battery electric bus running on a city centre service through narrow streets which despite its small size it still only just manages to negotiate. 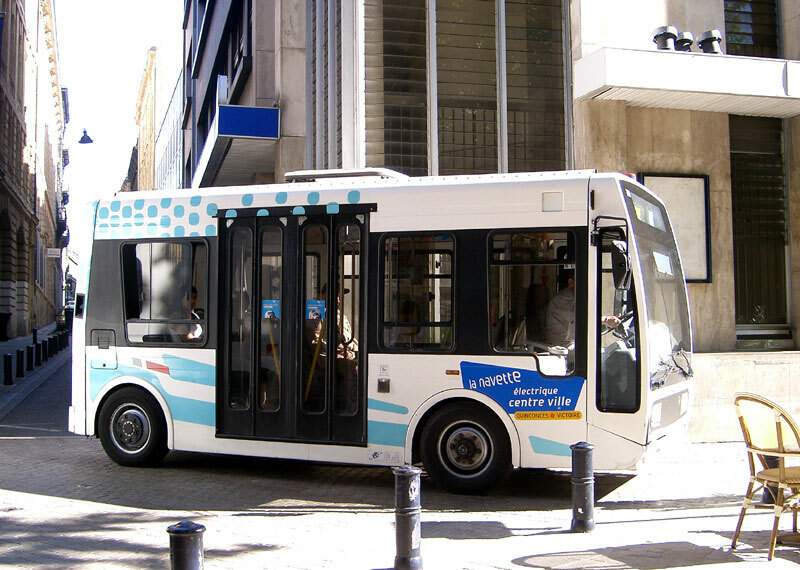 Small fleets of vehicles such as these operate in several cities spread around Europe, where they are often seen to provide a very effective transport solution in pedestrianised and environmentally sensitive areas. This page is a branchline off the main website so after viewing it should be closed - however in case you arrived here courtesy of a search engine then this link will take you to the Albums pages index http://citytransport.info/Album.htm and this link http://citytransport.info will take to you the opening page of this website. This page last updated 31st December 2016.